On this date in 1939, one day after Adolf Hitler aborted his plan to in­vade neigh­boring Poland, Ger­man mobili­zation con­tinued. Between August 25 and 31, a further twenty-one infan­try divi­sions and two motor­ized divi­sions were in place along the Ger­man-Polish fron­tier, while arma­ments for other units were strength­ened. A total of 1.5 mil­lion men were within miles of the bor­der or in bar­racks pending orders to move. From August 26 Ger­man air­ports were closed and Ger­man air­space became a restricted zone. Diplo­mats needed per­mis­sion to travel out­side the capital. Across the fron­tier, what amounted to a gene­ral Polish mobi­li­za­tion was ordered on August 23 for all army units in the Polish Cor­ridor and much of west­ern Poland. On the 27th the remaining Polish reserve units were mobi­lized. In Great Britain, Prime Minis­ter Neville Cham­ber­lain (in office 1937–1940) refused to sanc­tion gene­ral mobili­za­tion owing to the fear that it could be used as a pre­text by other states, as it was in 1914, to mobi­lize in retali­ation. How­ever, on August 22–23 he autho­rized the first stage of calling up “key part­ies” to man staff rooms, com­mand posts, and anti-air­craft units. On August 24 all anti-aircraft and coastal defense posi­tions were ordered to be fully mobi­lized, in­volving more than 120,000 men. Cham­ber­lain also took steps to create a multi­party “War Cabinet,” which in­cluded his future suc­ces­sor and strong anti-appeaser, Winston Chur­chill (1940–1945), whom Cham­ber­lain restored to his execu­tive cabi­net as First Lord of the Ad­miralty. In an ad­dress to the British Parlia­ment on August 24 and in a letter to Hitler on August 27, which con­veyed pretty much the same thing, Cham­ber­lain reit­er­ated his pledge in the face of “the im­mi­nent peril of war” that British com­mit­ments to defend Poland’s inde­pen­dence would be honored unre­servedly lest any­one in Ber­lin think other­wise. As in Britain, Ger­many, and Poland, so in France. On August 24 Premier Édouard Dala­dier (1938–1940) author­ized steps to bring his coun­try to a state of pre­limi­nary mobili­za­tion. French Army chief Gen. Maurice Gamelin re­assured Dala­dier, “We have a respect­able parity in equip­ment.” Euro­pean politi­cal and mili­tary leaders appeared ready and able to pro­tect them­selves against Hitler’s next aggressive threat. 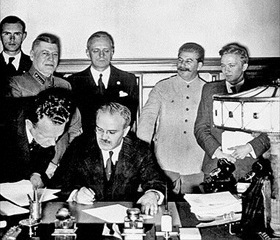 Left: Soviet Foreign Minister Vyacheslav Molotov signs the Ger­man-Soviet Non-Ag­gression Pact watched from behind by Ger­man Foreign Minis­ter Joachim von Rib­ben­trop and, to his left, Molo­tov’s boss, Joseph Stalin. 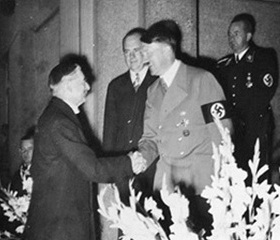 Hitler had hoped that the August 24, 1939, pact (rati­fied by the Kremlin on August 31) would pro­voke the Polish-British-French axis to col­lapse, allowing Ger­many to launch a swift, suc­cess­ful, and local­ized war against Poland to which Poland’s friends in the West could not quickly or effec­tively respond. The drama­tic news of the pact had much less effect on British and French leaders (and the public) than Hitler had expected. He had anti­ci­pated their govern­ments to fall, but West­ern intel­li­gence ser­vices had already pre­dicted the out­come of Ri­bben­trop’s hasty visit to Mos­cow. Also, public opin­ion in the West had shifted from a dread of war to a fata­listic acceptance of war. Right: Neville Chamberlain and Adolf Hitler in the days leading up to the Munich Agree­ment, Septem­ber 1938. Unlike the 1938 crisis, which ended when the major Euro­pean powers black­mailed Czecho­slo­va­kia into handing Ger­many its Sude­ten­land (pri­marily eth­nic Ger­man any­way), the Polish crisis of 1939 turned out to be unsolv­a­ble: Cham­ber­lain demanded as a pre­con­di­tion that Hitler aban­don war against Poland as an option in settling Polish-Ger­man dis­putes, and Hitler was abso­lutely deter­mined to con­quer Poland despite West­ern guaran­tees to main­tain Poland’s inde­pen­dence and borders.